In the Great Observatories Origins Deep Survey , 243 redshifts of objects fainter than 25.5 mag. were observed. Remarkably, two of them turned out to be very high redshift at z = 4.800 and z = 4.882. Even more remarkably these two fell only 3 and 1.5 arcsec on either side of an emisssion line galaxy of z = .733. ( The ESO Messenger No. 118, p.49 and Vanzella et al. astro-ph/0406591. ) 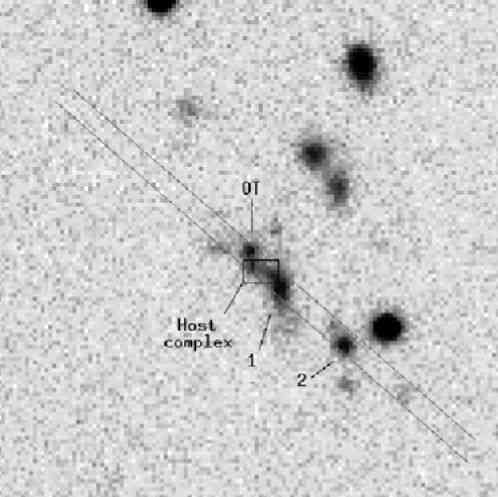 The picture shown below is probably sufficient to convince most people that this is another pair of ejected, intrinsic redshift quasars. 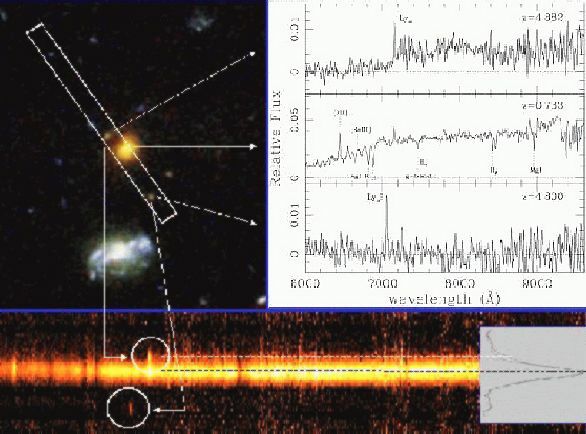 They do not reference the paper Geoffrey Burbidge publlshed titled "The Sources of Gamma-Ray Bursts and their Connections with QSO’s and Active Galaxies" ( ApJ 2003, 585, 112. ) Since, as usual, none of the above authors reference the voluminous evidence that quasars are intrinsically redshifted objects ejected from lower redshifted galaxies, there is very little chance of conventional astronomy correcting a huge error in their fundamental assumptions. The consequences for astronomy, and science in general, are discouraging to contemplate.